This festive basket of flowers brings a party to the recipient. The basket arrangement features yellow daisies, red carnations, pink asters and more. 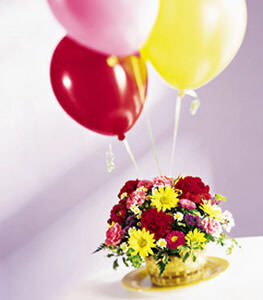 The bouquet arrives with 3 latex balloons in assorted colors. Great for any celebration or spreading good cheer.